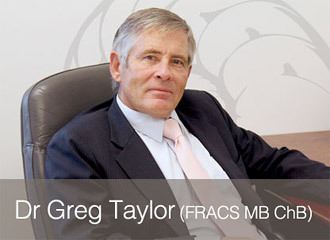 Dr Gregory Taylor (FRACS MB ChB) graduated at Otago Medical School and completed his training in Plastic and Reconstructive Surgery at Burwood Hospital in Christchurch in 1982. He gained further training and experience in Canada, Scotland, Arabia and the United Kingdom before returning to New Zealand into full time private practice. Dr Taylor has over 30 years’ experience as a Specialist Plastic Surgeon in New Zealand with experience in cosmetic surgery, reconstructive surgery, hand surgery and the management of melanoma and non-melanoma skin cancers. He is also recognised as a pioneer of laser skin surgery in New Zealand and for the breakthrough of local anaesthetic day stay facial surgery. He is a professional member of New Zealand Association of Plastic Surgeons, Australian Society of Aesthetic Plastic Surgery and a former president of the New Zealand Foundation of Cosmetic Plastic Surgery. Dr Taylor is a published author and has presented papers at scientific conferences and regularly attends international symposiums to keep informed of current trends and developments. To enquire about Dr Taylor’s services please contact Nelson Plastic Surgery.